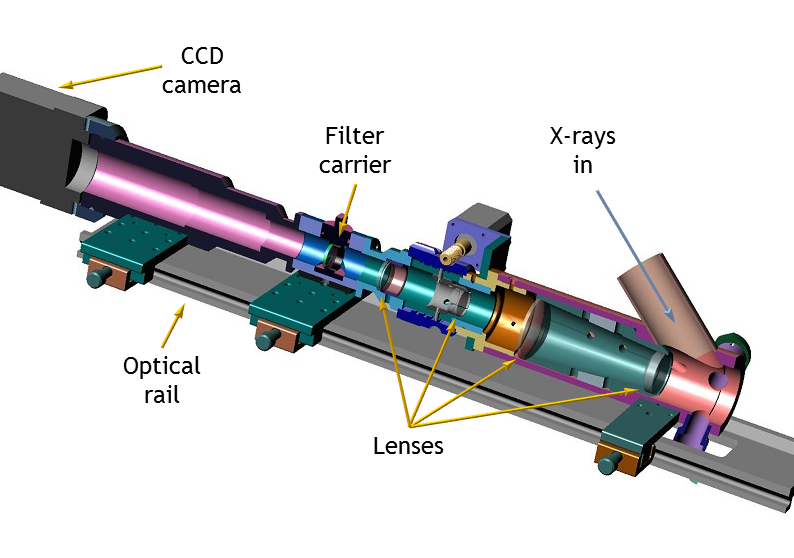 Synchrotron-based X-ray absorption spectroscopy (XAS) is an extremely powerful probe of local atomic stucture in a wide range of materials, from metals and semiconductors to liquids and molecular gases. When an X-ray with sufficient energy (greater than the core electron binding energy) strikes the sample, core ionization of the absorbing atom produces a photoelectron which is subsequently scattered by neighbouring atoms. Interference between the outgoing photoelectron wave and the scattered electron at the absorbing atom modifies its absorption coefficient. So, by sweeping the X-ray energy across the absorption edge of a particular element, its chemical environment can be determined - we have a elementally-selective local probe. X-ray absorption is commonly determined by measuring transmitted X-ray flux or the intensity of fluorescent X-rays produced as a result of electrons falling into the core holes from higher orbitals. However, the decay of the core holes also produces electrons via Auger processes, leaving the system in an excited state with electrons in the conduction band and holes in the valence band. The radiative recombination of these electrons and holes produces visible luminescence. The number of Auger processes depends on the number of absorbed X-rays, so the luminescent intensity contains the same modulations - and consequently, the same structural information - as a conventional transmission/fluorescence measurement. Incidentally, the Auger electrons can themselves be measured directly; this is total electron yield (TEY). As a consequence of the shallow escape depth of visible photons, XEOL is inherently surface specific, whereas conventional measurements are dominated by the bulk signal. XEOL also has the potential to be site-selective. If the the electronic structure due to the local environment is such that particular radiative transitions are favourable (due to defects, doping etc. ), then a simple optical filter can be used to extract the spectrum for that specific site. XEOL has another extremely useful characteristic: the visible emission is easily manipulated using conventional optics. So, if the light is formed into an image, we gain lateral resolution and have a method by which a chemical map of the sample surface can be obtained. 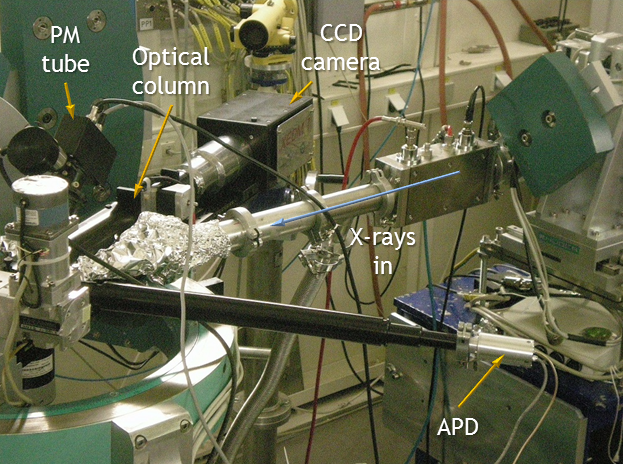 This is the basis for the XEOL microscope (XEOM), a prototype instrument for carrying out such measurements. Further information can be found in the posters which I have presented during my PhD.